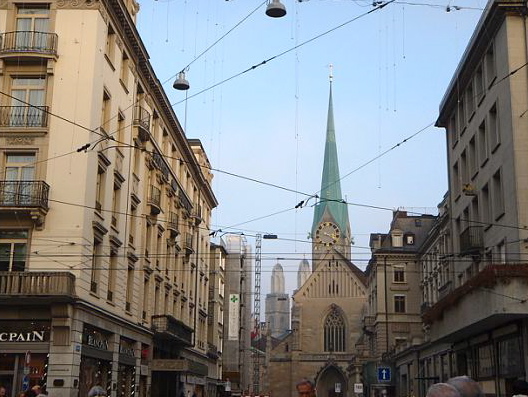 Between the two youth hostels in Zurich that I compared for our stay in December, one had a great location but was not so clean and the other was a bus ride out of town but was immaculate. As always, location, location, location was the right choice. Hotel Biber City Backpacker is on Niederdorfstrasse, a couple blocks from the Limmat River that cuts through old town Zurich, within minutes' walk of just about all the city sights. Niederdorfstrasse is pedestrian-only, with lots of little cafés, bakeries, and a Migros supermarket, so it's not a problem that Hotel Biber doesn't serve breakfast because there are lots of options just steps away. The hostel is only a 10 minute walk from the train station, too. But was the hostel "not so clean"? What about all those stairs up to the reception desk complained about on the TripAdvisor reviews? Personally, I felt the rooms were clean. The bunk beds had some graffiti on them and the wool blankets were military-gray and heavy, but the rooms were neat. Not so neat and tidy with teenagers in it. We had two rooms with three bunkbeds each; each room also had a sink. Bathrooms were shared with hallmates, but they were clean and convenient. The showers had nice water pressure and besides some mold on the ceiling, were spotless. I guess one expects perfection in Switzerland so one notices the flaws here, but in any other country this would be an A+ hostel. We also found the staff to be tremendously helpful and kind, with perfect English skills. I would definitely stay at Hotel Biber again. The price of our 6 bed room was 36 CHF, a single room is 75 CHF, a double with two single beds is 114 CHF. They have triples and quads, too. Sheets are 3 CHF extra. "Not so neat and tidy with teenagers in it"...that made me laugh, no matter how true it is. Sounds like a good hostel, but I'm curious...Is it normal for hostels to charge for sheets? Yes, it's common for hostels to charge for sheets, because you can save money by bringing your own sleeping bag. This hostel also charged 2 CHF per towel. this is a great overview of City Backpacker Hotel Biber and those pictures are very well taken as well. Those kind of reviews makes the issues about cleanliness and atmosphere more clear. Amazing place, it would be great fun to visit it. I am really impressed by your article. Keep on writing.